Want to see what's going on with your refrigeration system? Leave Thermoco in a case you are having problems with and come back the next day and you will have an idea whats been going on. Brewing your own beer? Try Thermoco to help keeping the right temperature. Fertiling chicken eggs? Put Thermoco in the incubator and track the temperature in your phone. This app works with Thermoco. Thermoco is a coin size smart gadget, it measures and records room, fridge, cooler, camping tent, body temperature and much more. You can use your phone/pod/pad talk to it in real time. 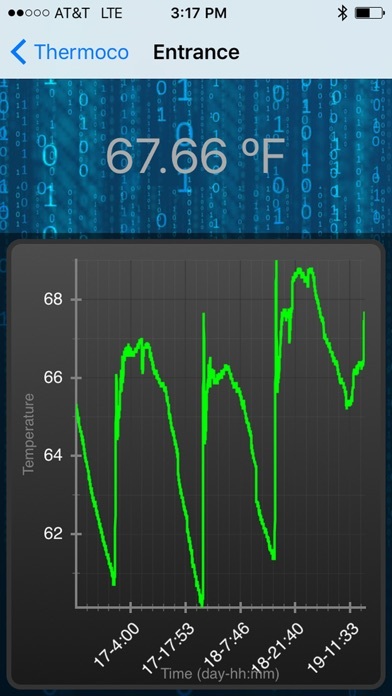 See current temperature, history temperature in digits and graph. Run the app, it will search and connect with Thermoco automatically, NO pairing is needed. 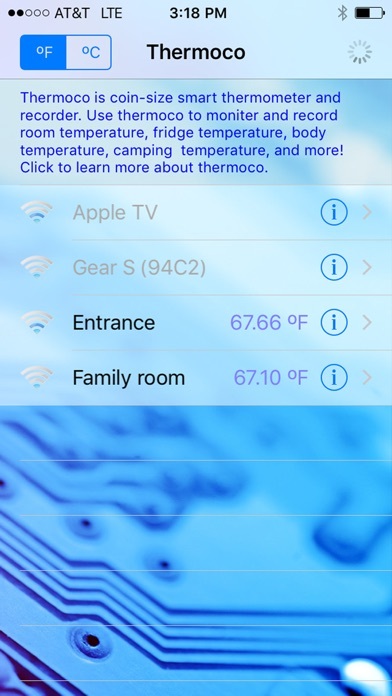 Click on the "i" button next to Thermoco to name your own device. Long press on the temperature on the graph page for calibration if needed. You can find more information about the little gadget at : http://www.outdoor-apps.com/store.html You can get Thermoco from: Developper's store: http://www.outdoor-apps.com/store.html Amazon: http://www.amazon.com/dp/B01ESHSAW0 Ebay: http://www.ebay.com/itm/Thermoco-Smart-Thermometer-Recorder-/131790317769 Please email us at support@ksolution.org for any questions/suggestions you may have, we will answer. Thank you! This was a Kickstarter project, and has delivered product reasonably on time and the app provides the basic advertised functionality. Now that the pressure of getting the initial deliveries out I'm hopeful that the app will become more refined.